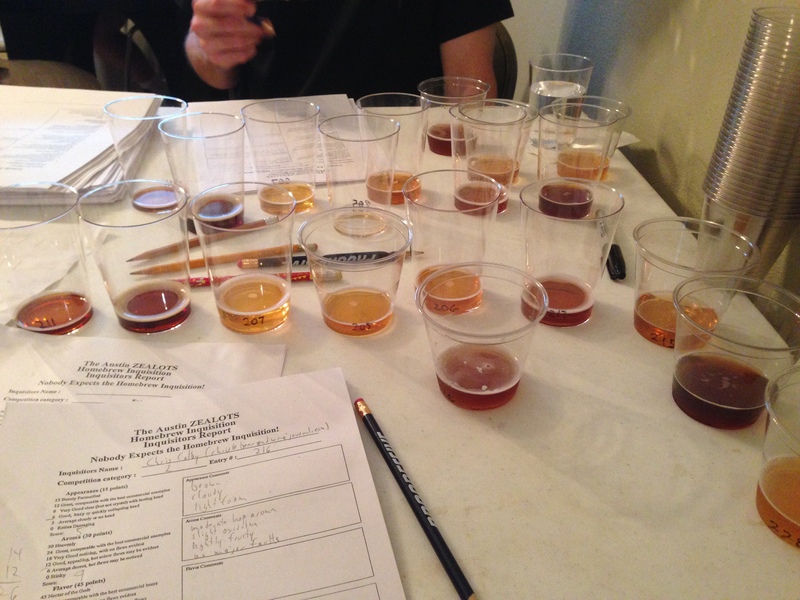 The flight of hoppy beers I judged at the 2014 Austin ZEALOTS Inquisition. Tasting the one or two standout beers in each flight versus the teeming middle ground made me wonder what separated them. All had been brewed with enough care to avoid contamination and major flaws in fermentation. Most tasted as if they were based on decent recipes. (In the hoppy beer category, the most common fault was a lack of hop aroma — at least compared to the best examples in the flight.) If you were to taste most of these beers in isolation — i.e. not in a lineup of competing beers — you would likely have found them acceptable, and many times even good. So why did a few entries stick out as beers that were rivals of the best commercial examples, while most of the others were “merely” competently-brewed beers? What separates the best homebrew from the rest? Before discussing what I think the differences are, I think it’s useful to list some things that are not likely to be factors. For instance, I don’t think that time was a factor. I would guess that the average brewday in which a superior beer is made is probably roughly the same length as a brewday that resulted in an average, or “pretty good” beer. Likewise, I think the overall amount of effort put into brewing a great beer is probably in the ballpark of that expended brewing something less than great. (Although, as I’ll get to, perhaps just a little added effort at a few key points might tip the balance.) I don’t know what kind of breweries these beers were made in, but I sort of doubt the sophistication of the brewery played a primary role. Longtime, serious brewers tend to end up with more fancy breweries, so there might be an indirect correlation. However, I know a few homebrewers who make very good beers with very “low-tech” equipment. The main reason I mention this is, I suspect that any homebrewer capable of brewing good homebrew could make great, even superior, homebrew without a lot of extra time, effort, or expense. My guess — and it is just a guess, although hopefully an educated one — is that paying attention to a handful of key details separates the best homebrew from the rest. In the final installment of this article, I’ll make a few concrete suggestions as to what exact changes could be made. For the most point, it boils down to taking every relevant detail seriously. I know a few homebrewers who make very good beers with very “low-tech” equipment. Do any of them use a whisk to aerate their wort? Herb, I use a MixStir attached to a drill. Does that count? Great article, Chris. I look forward to the second part. Herb, No. They use either oxygen or aquarium pumps. I know you like the whisking method, and that’s fine, but there are better ways to aerate your wort. And many brewers want to use the best methods when they able. Chris believes whisking or using a MixStir constitutes cutting corners. Good to see others disagree.